A stronger dollar is always deleterious to stronger gold, but perhaps what's most important of all is you're three or four euros under a new high in gold, in euro terms. I think gold is nothing more than a currency. I don't look at it as an inflation hedge anymore. As I tell people I have only been at this for 45 years so I am relatively new to it. But this is the sort of volatility that I have never seen… I’m talking about commodities and equities across the board. Even in the bond market. In aggregate I am seeing movements I have never seen before… These are unprecedented … It is very difficult for someone like me who grew up in a different era to make sense of what is going on. 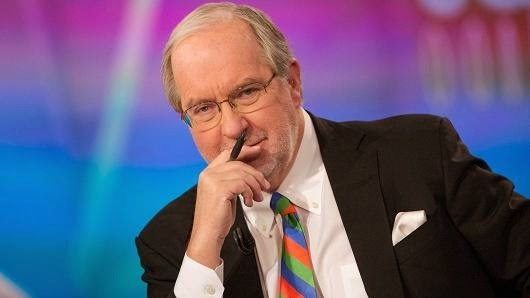 Dennis Gartman says he missed a "V bottom"
This is the type of volatility that is absolutely beyond my ken. Quite honestly, I have not seen anything like this in the last 2 weeks. In retrospect, one should have thrown all caution to the wind, covered any short positions, and spent cash and bought stocks. When I went to neutral 2 weeks ago, the stock market is still below than when I went neutral. Clearly, in retrospect, I should have bought it. I'm not that smart, nor should I ever be. Clearly, I missed the V-bottom. And I'm going to be okay with that fact. Even if it rallies a little bit, its still below where I went to neutral and I'm going to stay that way. This is the start of a bear market and it could last for several more months I'm afraid. This could be more than a mere Seven to Ten percent correction. The (Euro), we fear, is doomed to failure at this point. The political anger that has been evidenced in the battles over (European Commission president-elect) Mr. (Jean-Claude) Juncker's proposed Cabinet shall erupt in full flower in the days ahead. The FIG countries cannot abide further austerity; austerity in the face of 20+percent unemployment is economic nonsense. On the other hand the GAFs, with sub 6 percent unemployment, really don't need an expansionary monetary policy, can abide fiscal conservatism and will fight for both. As the world awaited a hoped-for clear and precise statement that the ECB was prepared to actually take action on monetary policy and become expansionary, it instead heard a lecture explaining that he and the others on the ECB's monetary policy committee had done all that they could do to try to strengthen the economy there and that the real battle had to be waged by the political authorities to reform the sclerotic nature of the economies there. The environment has turned toxic to be quite honest and has been made worse by the Ebola circumstance. I think that will turn the psychology of the average investor. Rather than becoming expensive and looking for good news, people are going to be fearful of bad news. And it bothers me greatly that the broader stock market indices, the Russell for example has failed to make new highs, has broken major trend lines. And I think this is more than a 3 or 5 percent correction. I think this could be a relatively 10 or 15 percent correction from the highs. Now I think the proper place to be is in cash, on the sidelines. I think the global economy is still going to be strong. It's time to start looking at owning those very simple ideas. Very simple ideas—I want to buy steel. I want to buy rails. I want to buy aluminum. So, Alcoa and big steel are my ideas again for the first time in a while. It's an old story of mine. He [Neves] has no chance whatsoever to win the election. President Rousseff is going to win. She is a Marxist, a former guerilla. I'm sorry, ex-Marxists and former guerillas do not change their stripes. I'm fearful of this young lady [Rousseff] being president again. She is going to, I think, move even farther left. German firms, if we've learned anything about them over the years, operate quietly for the very most part. They do not like controversy. They prefer stability; they live and breathe the chain-of-command and they abjure those who stand up and cause confusion and/or consternation within that chain. The bond market is bigger by far than the mere machinations of Mr. William Gross, genius though he is, has been and likely shall be in the future. You know, you always hear people say that copper is the commodity with a Ph.D. in economics, I've always said, really, it's got a master's degree. When you look at aluminum, zinc, tin and copper combined then it gives you an idea of what's going on in the global economy and aluminum, zinc and tin are very strong. Money is moving away from Europe and its moving to the United States, and it's going to park itself into debt securities. In a bull move, you want to own the Bond market. You want own the 30 year. You want to be short the 10 years. You wanna own the Back end of the curve, you want to be short Front end of the curve. It reminds me so much of the late 1990's when you had goofy names, and its a wonderful company and they make great product so lets give them congratulations. But a lot of the market depends of the psychology and this just reminds of me so much of the furor, the frenzy that prevailed in the late 90's and early part of the century. Be careful. If you want to look at chicken and have to be involved in the chicken market, go look in the Tyson's rather than Crazy Chicken. Everyone laughed at me when I started buying aluminum nine months ago. You are going to see a larger off take of aluminum going into automobile production. It's the easiest way to meet EPA requirements for mileage is to make the automobiles and trucks lighter, and aluminum does that relative to steel and you're going to be selling, we're going to be selling, everybody's going to be selling a lot of automobiles for the Chinese. We caution everyone to be aware of the fact that although there shall be a great deal of conversation in the media about gold’s weakness it is worthy of not that gold even in US dollar terms has held its lows for the past full year and that the low made nine weeks ago was above the lows made in December of last year. Interim lows have held at progressively higher levels. 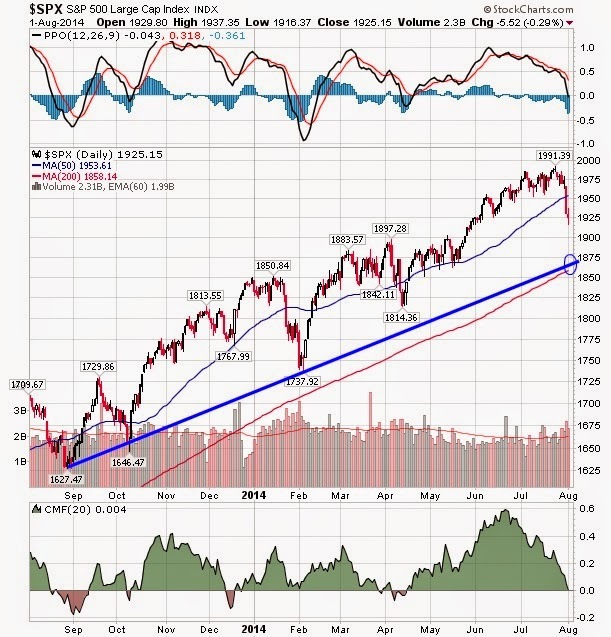 The psychology of the market may seem bearish, but the price action in broad terms is not. Gold rallies on geopolitical problems, but those gains are all too often given up rather swiftly. 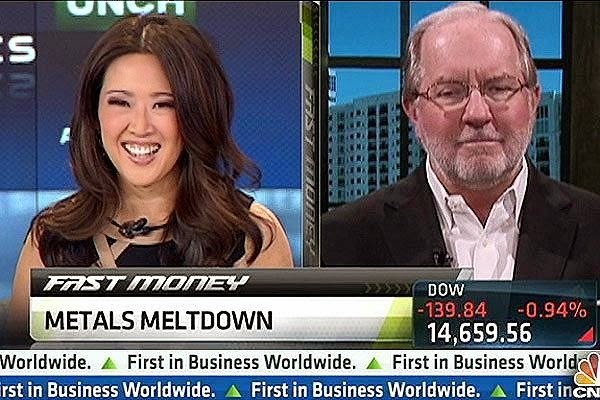 Dennis Gartman comments on the markets reaction to the Malaysian Air tragedy. I think we're going to have a great five years. I think we're going to be surprised at how strong the U.S. economy is going to be, and even how strong the global economy is going to be. 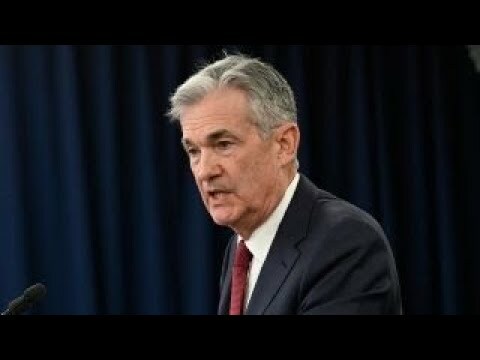 Although there are ‘hawks’ voicing concerns about inflation and the lack of economic response to QE and calling for sooner-rather-than-later moves to tighten monetary policy, the fact of the matter is this Fed shall err expansionary and shall refrain from tightening rates for a very long while into the future. Peter's talking about the fact that the United States is going to continue to destroy the U.S. dollar. But we also had the ECB come out and tell us last week that it will, in fact, be expanding reserves. I think you're better off being long of gold in euro terms than you are being long of gold in dollar terms for the foreseeable future. I am on the sidelines, I am neutral. I am long of Alcoa, long of Apple. I've written calls against them, I have some derivatives to bring that net position back to almost net neutrality. But I'm still long of Alcoa and long of Apple and its still a bull market. There are times when its wiser to be a bit moderate in ones approach and I think this is that time. I don't think you are going to get much of a correction, I don't think it will be much at all. This is a time to be net-neutral. Its time to be less long. Its more of a psychology call. I'm a little concerned that we got a little buoyant on the upside. Markets do get a bit ahead of themselves and that's all we gotten here. I saw some numbers, I was amused and interested in the fact, how much money was made in the first 4 or 5 days of the month and seasonally how bad things tend to get from middle of July to September on a historical basis. There are a number of things that made me say "probably a good time to go on the sidelines." Dennis Gartman feels that Deflation is coming to Agriculture and this could in turn benefit the major Food producers whose input costs are going to go down. "I think with the size of the crops, it is going to be a huge corn crop. It's going to be a huge soybean crop. It's going to be a reasonably large wheat crop. If you are a company whose major input costs are grains, you're going to have a great year. So I think you take a look at the Kellogg's of the world, the General Mills of the world. I think you take a look at the companies, live stock producers whose input costs are going to be declining. Deflation in agriculture is going to be a real harsh reality and its going to be beneficial to companies for those companies that use corn, soy beans, wheat as their major inputs." Gartman thinks the companies are not going to reduce their prices and that will benefit their stock prices. "They're going to keep their price increases in effect, but their input costs are going to go down. Therein lies an increase in their margins over the course of the next year"
Gold Shares tend to be a leader of the market. Gold shares have historically led the move higher or lower and gold stocks have been doing quite well over the course of past several weeks. So anybody who has been bearish gold finds themselves for the first time in many months on the wrong side of the trade. Prisoners were not taken yesterday as gold, silver and platinum came under pressure, with only the ‘Russian sanctioned’ prospects for palladium keeping that metal firm. We, however, have no intention of changing our positions: we are long of gold in yen and euro terms and we shall remain that way. Certainly we would prefer seeing gold trading better, but the fact that it has held the $1,300 level [and] well above its lows made months ago in yen terms, and has even held above the more recently lows made in euro terms, has impressed us and should impress others. Things are indeed growing disconcerting. They shall almost certainly grow worse and the West has underestimated the seriousness of Putin’s intent to restore the former Soviet ‘empire’ to one that is Russian. 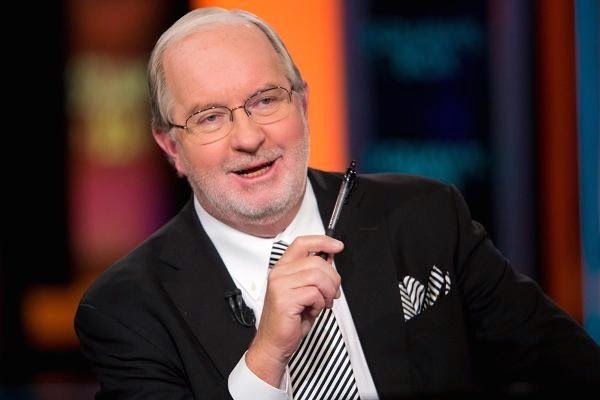 Dennis Gartman thinks gold is going higher quietly in terms on Dollars, Yen, Euro and Chinese Renminbi. "For the moment at least, the fear of war in Russia has been alleviated. But it's not eliminated. It's just been alleviated, and it was the fear of war that sent gold prices higher in the first place." "Any incursion by the Russians into mainland Ukraine, while unlikely, but remotely possible, would send gold soaring. 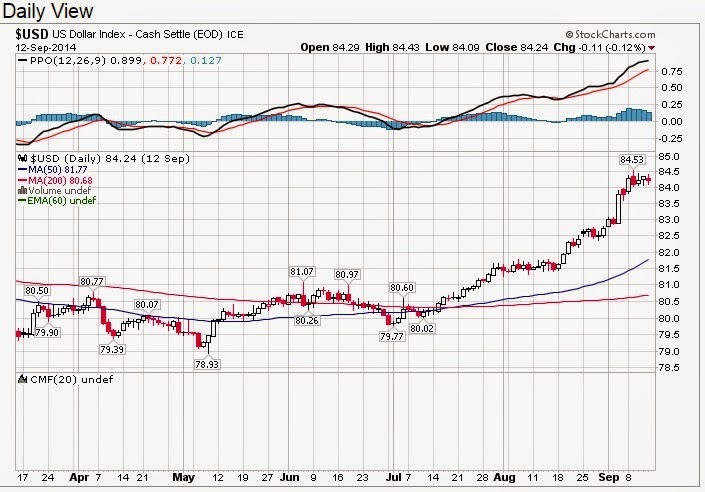 The chart is going from the lower left to the upper right." The smartest thing they can do to counter what Mr. Putin is doing is to fight him on the one weapon he has, which is oil. You could send oil down sharply and do very real damage to the Russian economy. "We'll argue that Dr.Copper is not sending a signal to the world of impending economic weakness but is instead sending a signal to the world that the banking system in China has very real problems." "We suspect that some banks have already called in their loans made in this manner, and that what we've seen in the past week is the first layer of that loan unwinding; however, there is no way to quantify that notion and we offer it up as it stands, without hard data. However, our fear is that the last banks in … the smaller banks; the regional banks; the banks that are always last to the feeding trough … are still holding copper collateralized loans that have gone from badly performing to horrid to now deeply under water in the matter of days. Panic liquidation has set in; the margin clerks are in charge and it is then that prices make their lows, but there is no way to tell when or where and at what prices those loans shall be finally liquidated." "We draw only that weather was and is a huge effect upon the numbers and we suspect that the Fed shall pay little if any heed to these figures when they meet next week, casting them all off as weather affected and turning their attention to other concerns." Gold and the precious metals are weak, but they are demonstrably less weak than are the base metals, with copper leading the way lower. 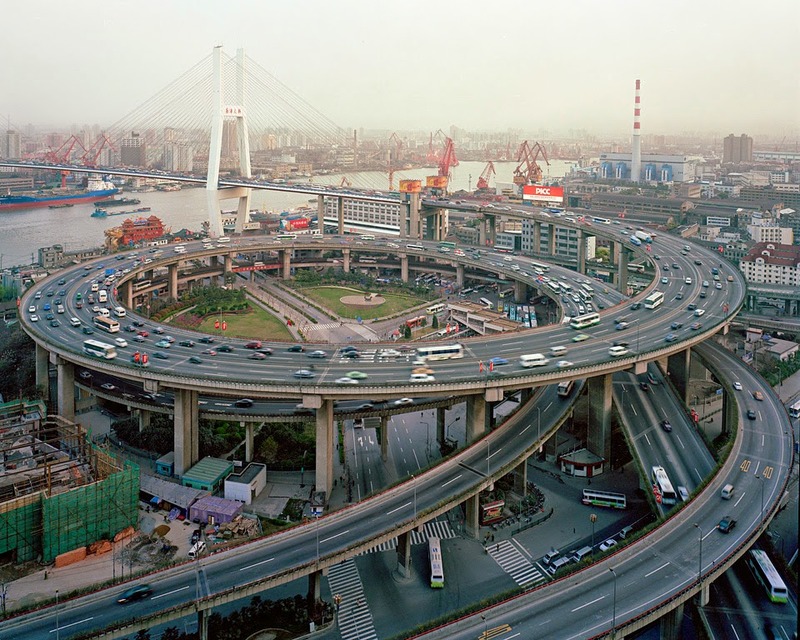 The economic news out of China has laid waste to copper prices. We shall then move to cover our long gold/short copper trades upon receipt of this market given that copper traded just below the supposed obscene number of $3.00 earlier today but has since rebounded. Copper is weak. Watch the video above on copper trade, and potential for China to run trade deficits for several years. Everybody knows there's going to be a big crop. Farmers like to plant corn. Three to four million acres of corn land should go into soybeans, but probably won't. I suspect the crop is going to be fairly good sized, but I think demand is going to be shockingly better than people anticipate. It's not making new lows. You learn in the business of trading that when something doesn't go down on bearish news, especially when something goes up on bearish news, you probably ought to be bullish on it. We have never been fans of Bitcoin, believing it to be nothing more than a scam of the first order and a breeding ground for drug dealing and tax evasion. Mt. Gox had delayed paying out trading profits and/or holdings of cash or of Bitcoins themselves in recent weeks, blaming problems on technical circumstances... upon “server” problems... or upon other technical irregularities. Now it is being reported that Mt. Gox has suffered the theft of several hundred thousand of its deposited Bitcoins and that the theft took place a year or more ago and is only now coming to light. Others are already trying to fill the void left by Mt.Gox’ demise, but we shall again urge caution and in most instances shall counsel utter and complete avoidance of all things Bitcoin related. We fear that even if these other “exchanges” can take the place of Mt.Gox, the damage done by this company’s failure shall be a pox upon the entire enterprise. Avoid Bitcoin if you can, for even if these other exchanges succeed, we can only suspect that participation in Bitcoin speculation shall eventually call the IRS attention upon those involved even in a modest way, and no one needs that attention. A word to the hopefully wise! I don't see any major reduction in accommodation that the Fed is pushing into the system. We are far from tightening; we are still aggressively easing, with $65 billion still going into the system between each FOMC meeting. Yes, that's down from $85 billion, but still, those are massive injections of reserves into the system. The Bank of Japan is doing even more than the Fed. Over the course of the last several years, as gold in dollars is down something like 35% from its high, gold in yen is down only 2%. I think that's interesting. If you think that the monetary authorities in Europe are going to be tighter, are going to be more hawkish than are the monetary authorities in the United States, you probably would not want to own gold in euros. You probably want to own gold in terms of dollars or in terms of yen. If you think the monetary authorities in Japan are going to expand the supply of reserves of yen faster than the European central bank, or the Fed here, or the Bank of Canada, or the Bank of England, then you would want to own gold in yen-denominated terms.